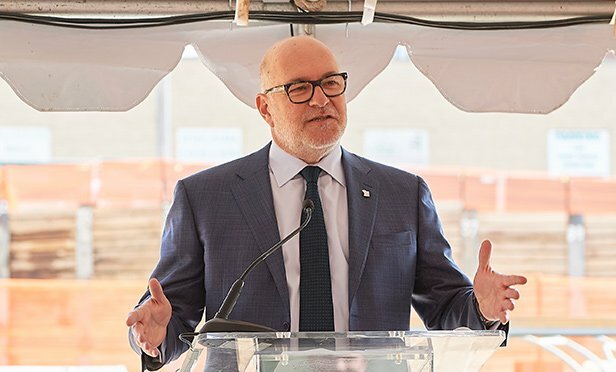 The global corporate headquarters of healthcare solutions company AmerisourceBergen will serve as an anchor for the transformative mixed-use, transit-oriented development. CONSHOHOCKEN, PA—Keystone Property Group has begun construction of SORA West, a mixed-use, transit-oriented development in Conshohocken, PA that will house the new global corporate headquarters of AmerisourceBergen. The global healthcare solutions company is relocating to an 11-story, 429,122-square foot office tower that will serve as an anchor for the wider SORA West development. Designed by Gensler Architects, the office tower is the first step in building the multi-faceted, transit-oriented development centered around a vibrant public plaza. The plaza will be framed by the 200-foot tower, a 165-key hotel with rooftop restaurant and lounge, a 1,500+-space parking structure to support these facilities, and the existing 139-year-old Conshohocken Firehouse, which will be recreated as a gastropub with an indoor/outdoor experience. AmerisourceBergen is among the largest pharmaceutical distributors in the world, providing a critical link between manufacturers and healthcare providers. The company was most recently ranked #12 on the annual Fortune 500 list, with more than $160 billion in annual revenue and employs more than 21,000 workers across 50 countries worldwide. The company will bring associates from two existing Pennsylvania locations into the downtown Conshohocken office tower, serving as its sole tenant. Occupancy is expected to begin in 2021. The AmerisourceBergen Foundation, the nonprofit charitable giving arm of AmerisourceBergen, launched a hyper-local grant program that will provide funding to community-based organizations within a five to ten-mile radius of the new headquarters. Tenants at SORA West will enjoy convenient connections throughout Eastern Pennsylvania, including Philadelphia, from the adjacent Conshohocken SEPTA train station. The property is also located in proximity to Routes 76 and 476. Keystone was named developer of the site in 2013 after an RFP process administered by the Borough and the Montgomery County Redevelopment Authority (RDA). SORA West is the latest large-scale mixed-use project developed by Keystone. Its portfolio also includes Washington Square, Philadelphia, PA, which is bounded by three iconic, historic properties developed by Keystone: the Curtis, the Washington, and 100 Independence Mall West. The Curtis is an historic publishing landmark in Center City Philadelphia reimagined as a dining, shopping, residential and commercial destination, and nearby 100 Independence Mall West, the future home of Macquarie Investments, has been transformed with a dynamic indoor/outdoor experience for pedestrians, with the popular Independence Beer Garden and a La Colombe coffee café.